Astronomical telescopes come in all shapes and sizes. When my own interest in astronomy developed in the late 1970s there wasn’t the choice of equipment available that there is now. Experienced astronomers usually used big Newtonian reflectors, often ones they had built themselves. Beginners had to make do with small, often poorly-constructed refractors. Choice was limited and prices were high (at least here in Europe). These days your choice is staggering. Telescopes come in a bewildering array of types and sizes. Prices range from impossibly cheap to very expensive. To make things worse, there seems to be lots of conflicting advice out there as to which types are best. Here I’ll take a look at what a telescope is, followed by a survey of the different types, along with their pros and cons. Finally I’ll give you some (hopefully impartial) advice on what and how to buy. Notes (like this one!) contain asides and non-essential detail. You can safely ignore them if you like. A telescope, you may be surprised to learn, is a very simple thing. Telescopes make things seem closer than they are, this everyone knows. They make things appear closer by collecting light to give a brighter image than the human eye could and then magnifying it to make it seem bigger. A mirror or lens (the ‘objective’) collects the light and focuses it; an eyepiece magnifies it like a reading glass. The result is that you get to see distant things bigger and brighter than you can see them with your eyes. That’s it. Every telescope works like this, from my old pair of 8x30 binoculars to the Hubble Space Telescope. Don’t believe me? Try this. Take a shaving mirror, reflect the Moon in it and examine the reflection with a magnifying glass – that’s a telescope. The details, the design, the size and price vary; the basic principle does not. Spyglasses like Galileo’s (or indeed Capt. Jack Sparrow’s) and most binoculars contain both the objective and the eyepiece to give a fixed magnification (see next section for an explanation of magnification). Most astronomical telescopes have interchangeable eyepieces to give different magnifications. The word telescope is derived from the ancient Greek verb ‘scopew’ – ‘I examine closely’. In fact the Greeks may have invented the telescope. Descriptions of the Pharos lighthouse in Alexandria hint at some sort of distance viewer. Over the centuries many other veiled descriptions of telescope-like optical magnifiers appear in works of Natural Philosophy by authors such as Roger Bacon in the 13th Century. Surprisingly though, the first definitive telescope was invented by a spectacle maker in Middleburg in the early 17th Century. Perhaps he was just playing around with different power lenses. Significantly for us, that delay between idea and instrument may have been due to the difficulty of making good mirrors and lenses: telescopes are simple, but they need precise manufacture to work properly. What makes a Telescope ‘Powerful’? 1) Brightness – how bright faint stars and nebulae appear using the telescope and the faintest stars that the telescope allows you to see. This is largely a function of the clear size of the telescope’s objective lens or mirror (its ‘aperture’). 2) Resolution - the smallest detail that the telescope can distinguish on the moon or a planet, or the smallest gap at which two close stars can be distinguished from each other. Again, the bigger the telescope’s aperture, the higher its resolution (theoretically at least). 3) Magnification - how much bigger an object looks than it does with your naked eye. This factor is variable. In theory any astronomical telescope can have any magnification given the right eyepiece, but see below! 4) Contrast – the way the telescope distinguishes between light and dark and all the shades in between. This is the most subjective performance factor and depends a lot on optical quality. Contrast matters when trying to see detail on planets. There are other performance factors which might affect the choice of a telescope for a particular purpose, but the above four are the basic ones and are true for any telescope. In particular, no telescope, however well designed and built, can escape 1 and 2 – these are fundamental laws of physics. In practice, many telescopes fall well short of their theoretical maximum performance much of the time due to factors like poor atmospheric conditions (‘seeing’), imperfect optical alignment (‘collimation’) and imperfect focus. From factors 1-4 you might conclude that a bigger telescope is a more powerful telescope and you’d be right. You might also conclude that you should therefore buy the biggest telescope with the highest advertised magnification, but in my opinion you’d be dead wrong. Read on. The more magnification the better, right? Wrong! The problem is that more magnification means a dimmer image and magnification makes any wobble in the ‘scope, mount or the atmosphere bigger too. In theory, most telescopes are useful at magnifications up to about 50-60 times for every inch of clear aperture. Even so, anything much over 100x will need a steady mount, preferably one that keeps the object in view. In practice, I rarely use magnifications over about 300x, even in big expensive ‘scopes. On many nights the maximum magnification is limited by turbulence in the atmosphere (‘seeing’) and not the optics. Adverts for cheap telescopes that claim ‘capable of 675 times magnification!’ are not lying, but such a magnification in a small ‘scope will be totally useless. In the same way, BMW would not be lying if they claimed their latest model would do Mach 2 … when fired from a big enough canon. Apart from magnification (about which, see above), these are the typical numbers you’ll see on telescopes and their packaging. By far the most quoted ‘number’ for a telescope is the ‘aperture’. This is simply the clear diameter of the main lens or mirror (crudely, the size of the hole where the light comes in). (Almost) all amateur telescopes fall in the range 50-500mm (2-20 inches) in aperture. The light-gathering power of a telescope increases with the square of its aperture; so do its size and weight. A 2 inch aperture telescope will fit in the palm of your hand. A 20 inch telescope may not fit in an observatory the size of your house. The other number you’ll often see quoted is the ‘focal length’. This number is the distance at which the main lens or mirror brings the image to a focus. A longer focal length doesn’t mean a dimmer image, contrary to popular belief, but it does reduce the maximum field width (the area of sky that fits in the view). A longer focal length also means higher magnification for a given eyepiece. So long focal length scopes may be good for the Moon and planets and double stars, but not so good for viewing or imaging big star clusters and extended nebulae. For some types of telescope (refractors and Newtonian reflectors) the focal length is close to the physical length of the tube. Other types have a folded optical design so the tube is much shorter than the focal length. The focal ratio is the focal length divided by the aperture. This may be expressed (confusingly) as aperture/focal length (e.g. 105/650) or a single number (105/650 is a focal ratio of 6.2, or roughly F6). Focal ratios commonly fall in the range from 5 to 20. This is exactly the same f-number as for a camera lens, which is just a specialised telescope, after all. Longer focal length telescopes are photographically ‘slower’ – the camera shutter needs to be open longer to record an image at the same ISO value. Again, this is the same as for a camera lens. It is harder to make a telescope which performs close to its theoretical limits with a smaller focal ratio due to the steeper curves on the optical surfaces. For this reason, short focal length telescopes are often more expensive for a given type. Put another way, you are more likely to get good optics in a cheap scope if it has a medium to long focal ratio. 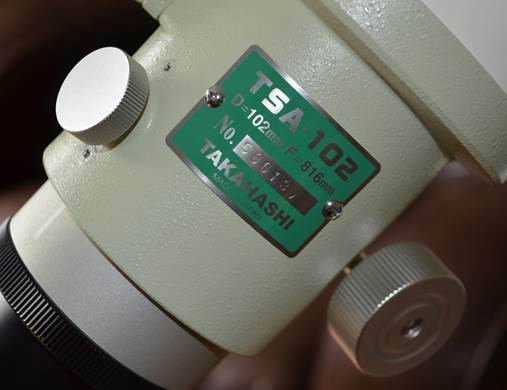 However, shorter focal ratios make the ‘scope more compact for its aperture and give a wider field of view. Like most things it’s a compromise. For general purpose use, a medium ratio will probably be best – F6 to F8. Just who invented the telescope is in doubt, but the earliest astronomer credited as using one was Galileo. The type of telescope Galileo used was a ‘refractor’, as were all early telescopes. Refractors use only lenses, not mirrors. Refractors vary in their detailed design (the type Galileo used performs poorly and isn’t produced now), but all use a lens at the front to gather light and focus it, another at the back to magnify the image (the eyepiece). A typical refractor is a long thin tube which you look in the end of - what most people think of when they hear the word ‘telescope’. I need to go into a bit of technical detail here to describe the major types of refractor and their differences. Much of the fuss and buzz around modern refractor design is about something called false colour (‘chromatic aberration’ in technical terms). Ever noticed a halo of purple or green around brightly highlighted things in your photos? That’s false colour. All but the most sophisticated (and expensive) refractors produce some level of false colour around bright objects. The bigger the telescope objective lens, the worse the effect (for a given design). False colour happens because the objective lens doesn’t bring all wavelengths of light to the same focal point. Mirrors don’t have this problem. For visual use, how much this affects you may be a personal thing – some people can ignore it, others can’t. However, it definitely spoils astro-photographs. So do all refractors have this problem? Yes and no. Refractors (modern ones) come in two different basic types – ‘achromatic’ and ‘apochromatic’, though the distinction is a little fuzzy. As a rule of thumb, achromatic refractors (‘achromats’) show some false colour, apochromatic ones (‘apochromats’) don’t. As you’ve guessed, apochromats –commonly termed APOs - use some fancy optical technology and are often much more expensive. Achromats have a pair of lenses combined to make the objective (‘a doublet’) made from normal glass. True apochromats may have three lenses (a triplet) or more, or use special materials for the lens (such as the mineral fluorite – not a glass at all), or both. Apochromats (‘APOs’) are more expensive than achromats simply because the lenses are more complex and/or use more expensive materials; semi-apochromats lie somewhere in between in both price and the level or false colour they show. Do I need an APO? The answer will depend on what you want the telescope to do, how much you’re willing to spend and, critically, how portable you need the telescope to be. So what does portability have to do with false colour? All achromats produce some false colour, but longer focal lengths produce less for a given aperture. Achromats longer than about F15 show very little false colour. The problem is that at F15 even the smallest aperture refractors will be a metre or more long. Try carrying that on board or on the Tube! So … if you’re not bothered about portability, or only want to use lowish powers (say for gazing at star fields and big nebulae), an achromat is fine. But if you want a really compact and portable, high performance refractor it’s going to have to be an APO. 1) For a given aperture and optical quality, refractors give the best performance because they have no central mirror to degrade the image. This is especially true of subtle contrast on planets. 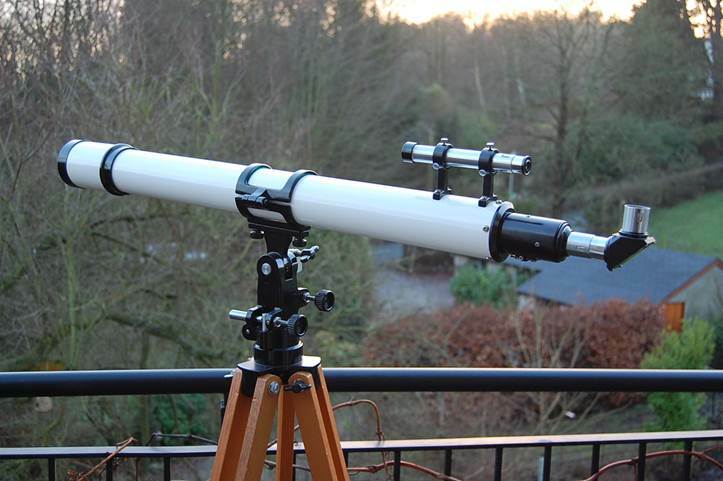 2) Treated kindly, a refractor should last a lifetime without significant maintenance. 3) In smaller sizes, quality refractors give pin-point wide-field views and images of star fields which reflectors generally cannot match. 4) For visual use, refractors tend to work better than reflectors in poor seeing conditions. 2) Size and weight. As the aperture increases, refractors rapidly become unmanageably large and heavy. This is because most refractors do not have a folded optical design and so are long and because big lenses have to be much thicker and heavier than similar size mirrors. The result? A typical 10 inch reflector is still quite portable; a typical ten inch refractor will be a big instrument needing a permanent observatory. 3) Cost. The difficulty of producing big lenses means that the cost of refractors (especially APOs) goes up much more steeply with aperture than for reflectors. 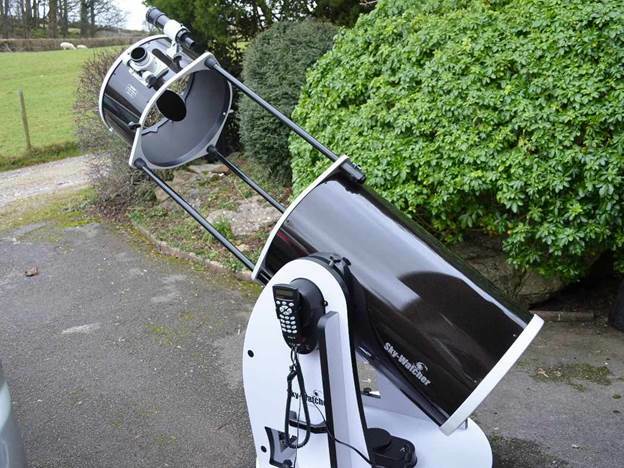 For comparison, you can currently buy a 16” Dobsonian reflector for £1000-£2000; the lens alone for a 16” APO would run about half a million. In my opinion, refractors make most sense in small to medium sizes where they can make very easy-to-use, versatile instruments which give lovely images and perform well even in mediocre seeing conditions. If you get aperture fever and must have a really big telescope (to gather as much light as possible for imaging faint galaxies, for example) it’s going to have to be another type, unless you are seriously wealthy. A true reflector uses only mirrors. This one is a type of Cassegrain. Reflectors are telescopes that use only mirrors to collect light and focus it - a lens only comes into the equation at the eyepiece. Reflecting telescopes were formally invented by the physicist Isaac Newton, but may have been known about (in theory at least) for a thousand years before. Reflectors now make up the vast majority of professional instruments, including Hubble. The reason for the popularity of reflectors among professionals is that above about one metre in diameter lenses become too thick and heavy to be practical. Even at relatively modest sizes, reflectors are much simpler, lighter and cheaper than any other type. If you think that ‘simple light and cheap’ means poor quality, you’d be absolutely wrong. On the other hand, if you think it makes them the best choice for all situations, you’d be wrong too. The simplest type of reflector is the original, the Newtonian. In this design, a single parabolic mirror at the bottom end, supported in an adjustable ‘cell’, focuses light onto a small flat mirror suspended in the centre at the other end in a device with legs to attach it to the tube, called a ‘spider’. 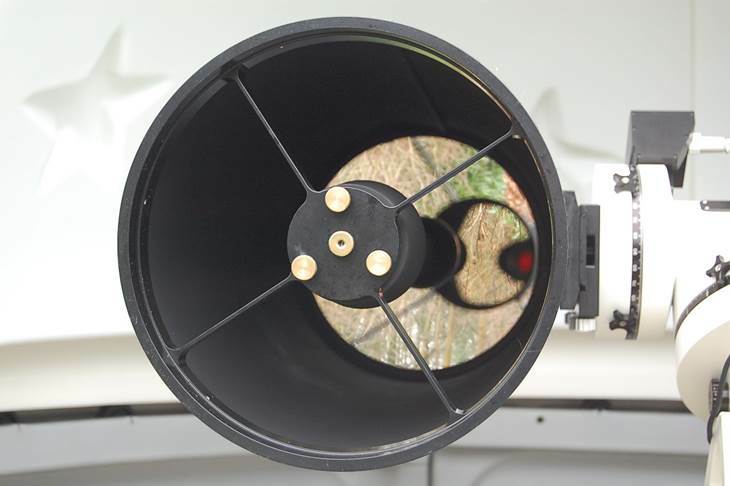 The secondary mirror just tilts the light through 90 degrees out to the focuser and eyepiece. In the middle of last century, by far the commonest type of telescope in amateur astronomy was the Newtonian. More recently, almost all ‘Dobsonians’ – a very popular type of amateur telescope – have been Newtonians. Newtonians have just one curved optical surface and so are fairly simple (for which read “cheap”) to make well and can give superb images. The other major type of reflector is the Cassegrain. Cassegrains have a folded optical design and so tend to be much more compact than Newtonians. In a Cassegrain, the secondary mirror is curved and reflects the light straight back down and out through a hole in the main mirror, instead of sideways. Cassegrains are no better optically than Newtonians and often have a more highly curved field of view, but they are crucially much shorter and so easier to mount. They are easier to use too, because you look in the end instead of the side. Pure Cassegrains have just two mirrors and are usually one of three types that differ in the sort of curves their mirrors use (and so in the way they perform): Classical, Dall-Kirkham and Ritchie-Chretien. Classical Cassegrains have quite wide, if somewhat curved (not so good for astrophotography) fields, with good sharpness for planetary work. These used to be a common type in older professional telescopes, such as the famous 100” at Mount Wilson and the 200” on Mount Palomar. Sadly, Classical Cassegrains are rare these days, perhaps because the secondary uses a type of curve – a hyperbola – that is hard to make. Dall Kirkhams are a type of Cassegrain that are easier to make and can give very high resolution views for planetary work. The problem with this type is that they usually have a long focal length and narrow usable field (not so good for deep sky and astrophotography). Takahashi’s “Mewlon” range is of this design. The Ritchey-Chretien is the professional’s design of choice for almost all large telescopes (Hubble included) but is the hardest to make (both mirrors are hyperbolic). The RC can have a short focal length and a wide field – ideal for astrophotography. BUT, before you rush out and buy one, you should understand that professionals never look through their telescopes! RCs often have a very large secondary mirror which seriously degrades the image for visual use (especially at high powers on planets). Think of the RC as a huge camera lens. 1) Reflectors do not suffer from false colour. 2) Reflectors are cheaper for a given size than refractors. 3) Newtonian reflectors in particular can be cheap and easy to make well. 4) Cassegrains are compact and lighter weight than catadioptrics of the same aperture. 1) All reflectors need periodic collimation (adjustment of the mirrors). 2) Reflectors often need their mirror(s) re-coating after somewhere between five and thirty years. 3) The unfolded light path of a Newtonian means that larger aperture Newtonians either end up being very long and unwieldy, or of very short focal-length (which can introduce distortions into the image). 4) The eyepiece of a Newtonian can end up in some very awkward positions if the instrument is mounted equatorially because it’s on the side at the top. 5) Cassegrains are expensive to make (though still less than refractors). 6) Classical and Dall Kirkham Cassegrains have a long focal length and so a small field of view. A compact catadioptric on the right mounted on a (slightly smaller aperture) refractor. This mouthful-of-a-name has nothing to do with eye-wear for felines, but encompasses all telescopes which use a combination of mirrors and lenses. Usually they are a variation on the Cassegrain, but Newtonian types exist as well. You will find several types of catadioptric on sale. Most common is the Schmidt Cassegrain (or SCT) made popular by Meade and Celestron in the 1970s, followed by the Maksutov. Catadioptrics are common amateur telescopes because they aren’t too expensive to make, do most things quite well and are very compact for their aperture. The Schmidt-Cassegrain (‘SCT’) has a full-width glass plate (not exactly a lens) of special design at the front to that can allow a flatter wider field than a pure Cassegrain. The SCT is a much criticised design, but in fact its characteristics can be good – a fairly wide and flat field, moderate focal ratio (usually 10) and short tube length. People will often quote the largish (30-35%) central mirror as a problem, but this isn’t really the main issue. The problem with SCTs is that some older ones were below-par optically. The recent Chinese ones I have seen have been good. The Maksutov has a thick, curved corrector at the front with the secondary mirror a silvered spot on the back of the corrector, though some have a separate secondary, like an SCT. Mak’s tend to be of longer focal ratio than the SCT, but have smaller central mirrors, which is a good thing. The best Maksutovs can be superb planetary instruments, but are heavy, expensive and slow to cool. Many variations on the catadioptric exist, such as sub-aperture Maksutov which has a small corrector behind the secondary mirror. These designs are typically hard to make well, so beware! 1) Catadioptrics can have a wider corrected field than some pure Cassegrains. 2) Some catadioptric designs use simple curves on their lenses and mirrors and so are cheaper to make than refractors or classical Cassegrains. 3) Because they are semi-sealed, catadioptrics need less cleaning and re-coating of their mirrors. 4) Catadioptrics can be very compact at long focal lengths and so can make great planetary telescopes. 5) Catadioptrics are widely available in range of types and sizes. 1) Catadioptrics have a longer focal length and so smaller field of view than most refractors and Newtonians of the same aperture. 2) Catadioptrics suffer from minor false colour, similar to an APO refractor and more than any reflector. 3) Catadioptrics tend to be heavier than reflectors, due to that big corrector up front. 4) Because they contain a lot of glass and have a semi-sealed tube, catadioptrics are slow to cool. This doesn’t matter much for small sizes, but can be a big problem with large ones! 5) Corrector plates tend to dew-up quickly on cold nights. 6) Catadioptrics often have large central mirrors which reduce their performance a bit and make them more affected by bad seeing (atmospheric turbulence on cold nights). Spotting scopes are compact, rugged telescopes, usually refractors, designed for terrestrial viewing (birdwatching, target shooting etc). They are designed to fit on photo tripods with panning heads and have an integral ¼-20 thread for mounting. Many spotting scopes are shock proof and water resistant, simple in use and give an upright image, like bino’s. So what’s the catch? 1) Optical quality may not be good enough for astronomical use. 2) Spotting scopes have prisms to provide an upright image. Fine for daylight use, prisms can give dim, or even smeared and fuzzy images on astronomical objects. 3) ‘Standard’ astro’ (0.965, 1.25, 2.00 inch) eyepieces don’t fit in many cases. 4) Most spotters have a maximum magnification of around 65x. This is too low for some astronomical purposes (double star, lunar, planetary). 5) Spotting scopes are usually too small (60-70mm) for other than quick-look astronomy. Unless you really want it for serious birding as well, avoid spotters for astronomy. If you buy, go for a premium make such as Leica, Nikon Swarovski and Zeiss. I’ve seen cheap spotters that are fine for birding but completely useless for astronomy because their optics aren’t good enough. You can buy more or less specialist gear to cater for all these interests. But know that in some cases what you end up with won’t do much else. For example, some specialist imaging ‘scopes can’t be used visually (or work very badly for it). Specialist solar telescopes often can’t be used on the night sky at all. 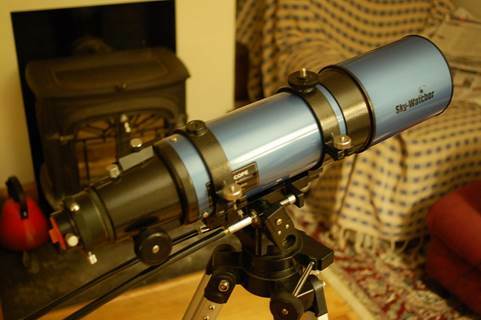 You could try using other people’s gear to find out what type of astronomy interests you then buy a specialist ‘scope to suit. But be careful! I have a friend who was blown away by the views of Saturn he got through a huge Dobsonian at an Arizona star party. But here’s the thing – he didn’t have to transport it, set it up and collimate it; and he didn’t live in Arizona with its dark skies and superb seeing. I guarantee if he’d bought a similar ‘scope over here as a beginner he would never have used it. 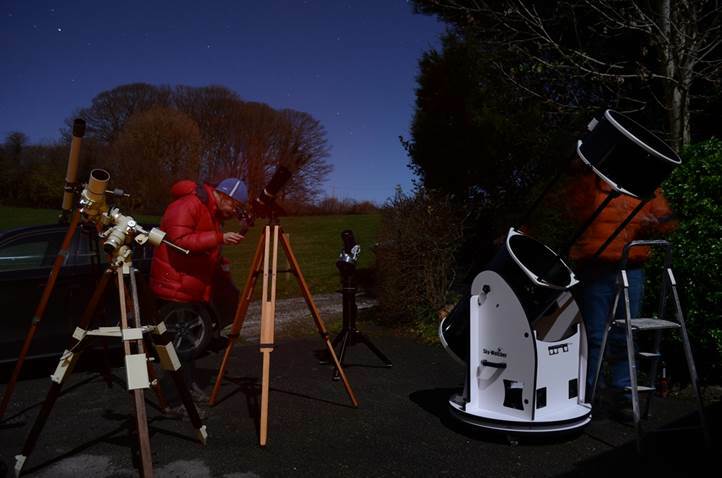 If you are new to the hobby it’s best to start with a modest, easy-to-use all-round telescope system that works for different types of observing or imaging as your interest grows and changes. Don’t buy a specialist telescope before you have some experience! This is hard. I got this one wrong (twice) by trying to get something too cheap. Most toy scopes will turn them off for life – put that EduToys telescope back in the rack at the toy store!! 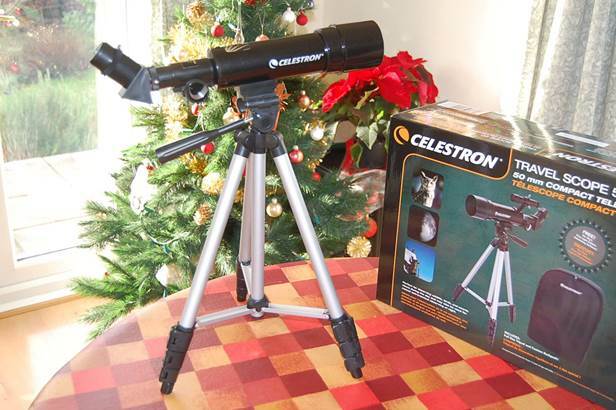 Children and teens need a simple, rugged telescope which is easy to use but actually shows them something interesting. The advice on choosing all applies, but portability and ease-of-use are even more vital. A good idea is to learn to use the telescope yourself first so you can guide them (i.e. help find things). If you’ve never done it before, this will be harder than you think! 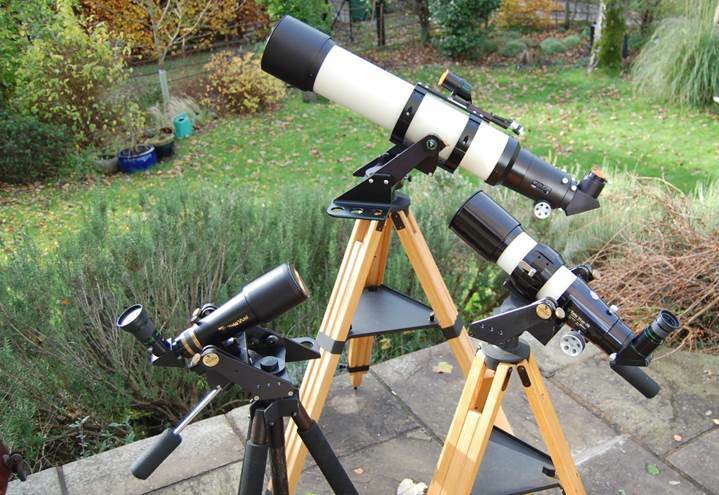 A selection of TeleVue refractors on simple push-pull alt-az mounts. The mount is just as vital to a good view or photograph as the telescope itself. Why? Good question. 1) Mounts for astronomical telescopes have a rather different job to do than those for terrestrial telescopes. The reason is that terrestrial targets either stay still or move unpredictably (think scenery and wildlife). Meanwhile, all objects in the night sky appear to move as the Earth turns. To keep what you are looking at (or imaging) in view, the mount will need to continually track the object in some way, even if you move the telescope yourself. 2) Astronomical telescopes typically need a wider range of movement than terrestrial ‘scopes – all the way from horizon to zenith (horizontal to vertical) in fact. 3) Astronomical ‘scopes can operate at much higher magnifications than most terrestrial telescope and so they need steadier (for which read heavier and sturdier) mounts and tripods. For all these reasons, tripods and heads designed for spotting scopes or cameras (pan-tilt heads, ball heads etc) only work with the smallest astronomical telescopes. Alt-az mounts are generally the simplest type because they move only up and down (in altitude and azimuth). In some cases you just push the telescope around to find and ytrack things, which is intuitive, but can be frustrating at higher magnifications, when it’s all too easy to push too far and lose your object altogether. Some more sophisticated alt-az mounts have slow motion controls so you can adjust them in small increments. It may surprise you to learn that alt-az mounts can feature electronics which find and track objects for you (so-called ‘GOTO’ because you get the mount to ‘go to’ a particular object or location). But for beginners, the simpler type with manual controls is best. 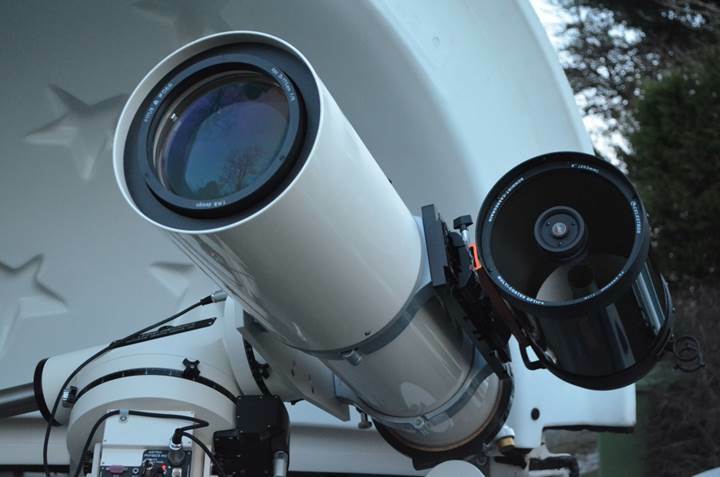 The Dobsonian offers a cunning way of exploiting the simplicity and performance of a large Newtonian on an alt-az mount. Dobs are simple, portable and cheap for their aperture and offer the best way to own a big telescope. However, Dobsonians don’t usually track and the bigger ones may need a step ladder to reach the eyepiece. Equatorial mounts are designed so that you only have to move one axis to track an object as the Earth turns. In practice this means that one of the axes (termed the Right Ascension or RA axis) is aligned with the Earth’s axis, often by aiming it at the Pole star. The other axis, the Declination or ‘DEC’ axis, is at right angles to the RA axis. In practice neither of the axes on an equatorial mount corresponds to up and down (unless you live at the pole or the equator). This seems odd at first, but comes into its own in use (honestly!) because to keep something in view you only have to move the RA axis (as long as it’s properly aligned). Many equatorials have the RA axis driven by something rather like a clock mechanism to track objects once you’ve found them. This is good for long-exposure photographs, but good for viewing too because you don’t have to keep fiddling with the mount to keep the object in view. 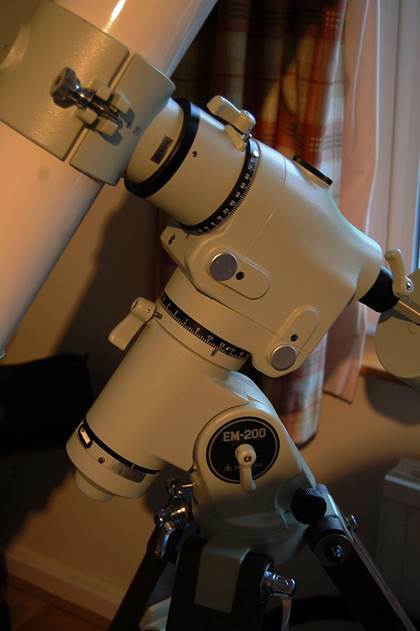 By far the most common type of equatorial is the so-called German Equatorial Mount (GEM). A German mount has the Telescope counterbalanced with weights across the RA axis. The other type of equatorial mount is the fork mount. In this case the telescope sits in a cradle which rotates on the RA axis. Most big professional telescopes use fork mounts, as do many Schmidt Cassegrains (SCTs) sold by the likes of Meade and Celestron. Because they are aligned with the sky as it appears to rotate, it’s much easier to locate objects with an equatorial mount too. Sometimes this is done with GOTO electronics, but can be done much more simply with dial gauges on each axis called setting circles. You can simply look up the declination and right ascension of an object in tables or an atlas, apply an RA correction for the time and then move the mount to that position on the setting circles. You just can’t do that with an alt-az mount unless a computer is helping out by doing some complex calculations. This robust equatorial mount is smooth and stable, but heavy to move and fiddly to align – not ideal for a beginner. A telescope setup you can just pickup and carry will get used much more than one you have to lug in bits! My first telescope was a little 3 inch reflector on a simple alt-azimuth mount. It was light in weight, simple to set-up and I used it all the time. My second telescope was a long-focus 3 inch refractor on an equatorial mount which was more complex to set-up; I used it less. My third telescope was a premium 8 inch Newtonian reflector on a massive mount. Its images were superb, but I hardly used it. Why? Because on most nights I didn’t have the time to lug it out in pieces, assemble it, wait for it to cool, use it, and then finally disassemble it and take it in again. The biggest and best telescope available will show you nothing if you don’t use it. Ask yourself how much you will really use a telescope that takes hours to setup, cool and use. Once every six months is not a love life and it won’t make you an astronomer either. 1) I have the space, cash and willingness to build a permanent observatory for my telescope from day one. 2) I have a leisurely lifestyle with lots of time free from work and family commitments. 3) I live in an area where there are very frequent clear nights with good seeing, such as the desert southwest of the U.S., southern Europe etc. This GOTO system is easy to use … when it’s setup and aligned (which can take ages)! Once you’ve got it outside and set-up, hopefully fairly quickly, you need a beginners’ ‘scope that’s easy to use. This starts with finding stuff to look at or image. You may be surprised how hard it is to find things through a telescope, even easy things like the Moon! A long focal length makes finding things much harder because (as you recall, don’t you?) it means a smaller field of view. A smaller field of view also means objects drift out of it more quickly as the Earth turns. Yes, in theory. The problem with most GOTO mounts is that you need to get them aligned first. Again, this can be surprisingly hard and often involves setting the ‘scope on a particular star or stars (just the thing you’re trying to avoid!) that the computer asks for. If you only have an hour of observing time, you may spend much of it aligning the mount. A smallish telescope with a short focal length and a good finder (re-dot varieties are best for beginners) on a simple mount will be easiest to use. 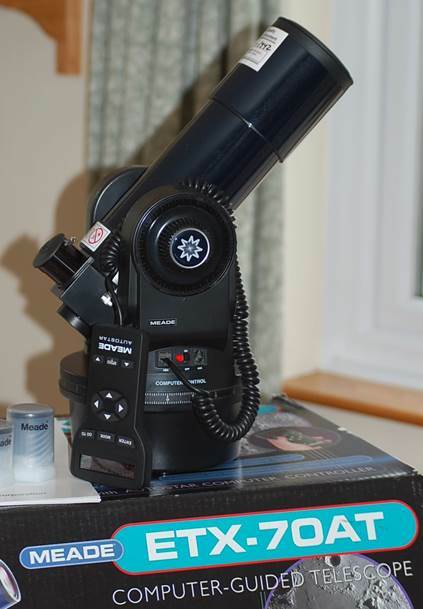 Lots of small scopes like this 50mm Celestron are given as presents, but the quality of some components is very poor. The author of the cult classic “Zen and the Art of Motorcycle Maintenance” – Robert Pirsig - went mad when he came to believe that Quality was the most important thing in The Universe. In terms of telescopes, he was pretty much right though. Know this: telescopes which are poor mechanically and/or optically are a disappointing pain-the-***. Cheaper ‘scopes from mainstream makers like Meade, Celestron and Skywatcher can be excellent too ... but not always (see the photo above). In general, avoid telescopes under 70mm aperture and/or £150 or so, even from these makers. Forget anything that smacks of being a toy. Keep it simple. Remember that basic mechanical and optical quality are MUCH (can I shout that louder?) more important than electronic gizmos, such as GOTO. Know that a simple achromatic refractor or Newtonian reflector on a basic altaz (up and down) mount will be much better for a given price-point than a fancy Schmidt-Cassegrain, APO, Maksutov etc. Consider buying used from a specialist web-site (Astromart, Astrobuysell). There are some surprising bargains to be had from upgraders. Ebay can be great, but only if you know what you’re doing. Don’t buy one of the flood of cheap new unknown-brand scopes on Ebay. You Don’t Need Naglers! Premium eyepieces have their place, but a good telescope on a solid mount, but with simple eyepieces will perform MUCH (I’m shouting again) better than a poor telescope with premium eyepieces. You could make your own (usually a Newtonian). Make sure you allow for the accessories you need. A bare-bones ‘scope (called an Optical Tube Assembly or OTA) comes without essentials like mount and eyepieces. Well-done for making it this far, even if you skip read it! You should now know everything you need to go out and buy your first astronomical telescope. It’s an exciting moment – enjoy it! The main thing is to keep it simple and keep it portable and go for optical and mechanical quality above size and features. Don’t get bamboozled by glossy Hubble pics on the box and don’t buy something too big and ambitious as a first ‘scope. A small, short-focus refractor on a simple alt-az mount makes a good beginners’ ‘scope. Ok, enough of the lecture, so what do I recommend? Many beginners buy Schimdt-Cassegrains telescopes on GOTO mounts, but I don’t recommend it. It’s not that these aren’t great telescopes – they often are – it’s just that factors like a long focal length and so small field of view, along with a complicated mount that needs aligning, can make them frustrating unless you have some experience already. 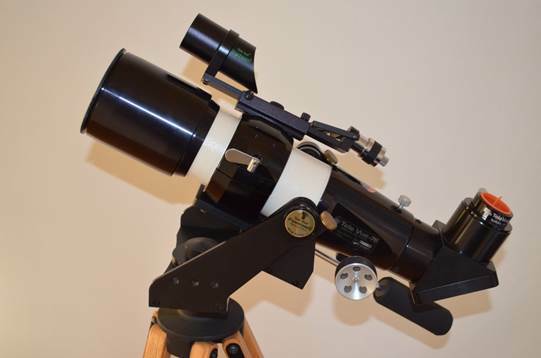 Instead, start off with a small portable refractor on a simple alt-az mount that you can keep as a quick-look, grab-n-go ‘scope to complement any bigger ‘scope you buy later on. Go for 70-100mm aperture, avoid focal lengths above about 600mm and buy from a good make like SkyWatcher. 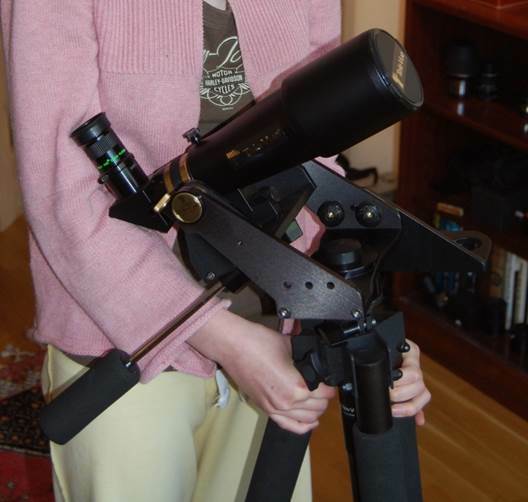 If you’re loaded, go ahead and buy a small Televue setup like this one – you’ll love it. A small TeleVue refractor with a red-dot finder on a simple alt-az mount: a near-perfect, but expensive, beginners’ setup. If you want more performance from the outset, especially for visual use on deep sky, a quality small-medium (say 4.5”-10”) Dobsonian is a great way to start. Again, SkyWatcher Dobs are great, but don’t bother with GOTO. SkyWatcher SkyLiner Dobsonians have great optics and clever features, but forget the GOTO.